Have you heard of Boogie Wipes? The name just makes me smile. Boogie Wipes has created a fun, interactive way for kids to learn to put their boogies in a Boogie Wipe and not on their sleeves! 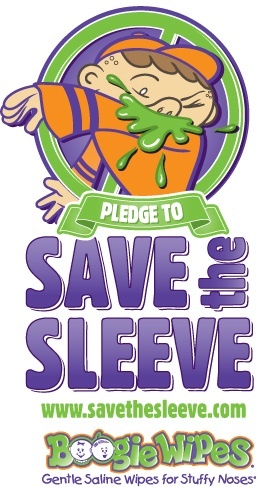 It's called Save The Sleeve. You can learn more here. These is one of the greatest things ever invented. They work so well. Since I have a school age child we are constantly bombarded with runny noses and other ickies. This works great to clean up those little noses. My 7 yr old even likes them. I was provided with a full size package of unscented and a handful of individual packets. Gracie immediately grabbed up the little packs and put them in her book bag. She shared them with her friends at school. I keep the big pack in the living room and Matthew runs to it when he has nose issues. You can buy these at Walmart, Rite-Aid, Amazon, Target...pretty much everywhere. Click on the link to the left and get a coupon and save! One lucky winner will receive (2) packs of 30-count wipes (fresh, grape, menthol, or unscented– combination varies). To enter leave me a comment telling me why you need these or how they'll make your life easier. Make sure you leave separate comments for each. Also please leave an email address if your profile doesn't link to one. I want to make sure I can reach you in case you win. Giveaway ends January 23rd at 11:59PM EST. Winner will be chosen using Random.org. I would like these because I run a home daycare and these would come in so handy! Lots of little runny noses! we go through a lot of these each year...we could always use more! We need these...cause we currently have boogies lol!!! We all have boogies this week, so we def need these!